House Speaker Joe Aresimowicz and Sen. Cathy Osten of Sprague at the CT Council of Small Towns forum. After failing for years to properly invest in highways, rail and bridges, the legislature should relinquish oversight to a transportation authority immune from the pressure of election-year politics, House Speaker Joe Aresimowicz said Wednesday. 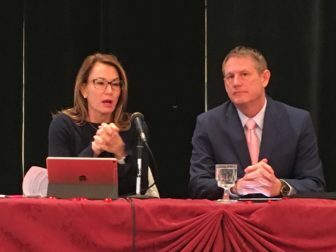 Speaking at the Connecticut Council of Small Towns’ annual legislative forum, the Berlin Democrat also renewed his proposal to eliminate local taxes on motor vehicles. But given that Aresimowicz also said pressures on state finances probably would continue to squeeze municipal aid, eliminating vehicle taxes probably would lead cities and towns to recoup the lost revenue through higher property taxes on households and businesses. Both of the speaker’s proposals sparked criticisms from Republican lawmakers at the forum, decreasing the likelihood either would win passage during the 2018 General Assembly session. 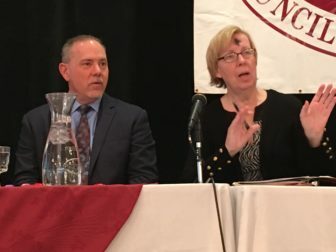 Warning leaders not to underestimate the frustration that Connecticut’s aging, congested transportation network creates among companies looking to locate or expand here, Aresimowicz said needed investments have been stalled for years by legislatures and governors fearful of repercussions among voters. “Nobody wants to do tolls; nobody wants to raise gas taxes,” the speaker told reporters afterward. Gov. Dannel P. Malloy warned Wall Street investors, the business community and the legislature earlier this winter that Connecticut’s transportation program is on the brink of a crisis. Aresimowicz recommended legislators create an authority to make major transportation policy decisions, with powers similar to those granted to the Public Utilities Regulatory Authority to handle energy-related matters. House Minority Leader Themis Klarides and Sen. Kevin Witkos. But House Minority Leader Themis Klarides, R-Derby, called the speaker’s proposal an abdication of power. When it comes to decisions about tolls, fuel taxes and major capital projects, “The only people, in my opinion, who should be making those decisions are the people you elect to do this job,” the minority leader said. Sen. Kevin Witkos of Canton, the second-highest ranking GOP senator, said the transportation fund is in tough fiscal straits because the Malloy administration accelerated transportation projects in recent years without a plan to cover the cost. Klarides said her party doesn’t lack courage to deal with transportation. “We don’t support (the governor’s plan) on its face, she said, calling it little more than a “revenue grab” to support overall state spending that continues to rise. Sen. Cathy Osten, D-Sprague, Senate Democratic chair of the Appropriations Committee, noted that the retail gasoline tax, which stood at 39 cents per gallon in 1997, was shortly thereafter reduced in two phases to 25 cents — and has remained there. “I don’t know anything else that stayed at the same funding level” for more than two decades, she said. Aresimowicz offered a potential compromise, suggesting a transportation authority be established, but that the legislature reserve the right to overrule its decisions with a two-thirds vote. “If we (legislators) were the appropriate body to handle this, our transportation system would be funded,” he said afterward. The speaker also recommended Wednesday that Connecticut eliminate property taxes on motor vehicles. Aresimowicz said it is a “nuisance” for cities and towns to collect and is grossly unfair. The same car in the same condition could be taxed at grossly disparate rates depending on the city or town in which it is housed, he said. House and Senate Democrats also said last fall that they wanted to eliminate the motor vehicle tax. But because the state budget is expected to be burdened by rapidly increasing retirement benefit costs for the next 15 years or longer, leaders also had no plan to replace the $700 million to $800 million the vehicle tax provides annually to cities and towns. The Council of Small Towns and the Connecticut Conference of Municipalities both criticized that proposal, saying it would only shift burdens onto a residential and commercial property tax base that already is overtaxed. Klarides said afterward that while the motor vehicle tax is inequitable, shifting more costs to home and business owners isn’t the best solution either. “Nobody is really gaining anything,” she said.